SANTO DOMINGO -- Alec Baldwin does a pretty convincing Donald Trump impersonation - just ask a newspaper in the Dominican Republic. El Nacional published an apology on Saturday after mistakenly running a photo of the actor doing his impression of the U.S. president on "Saturday Night Live" instead of Trump himself. 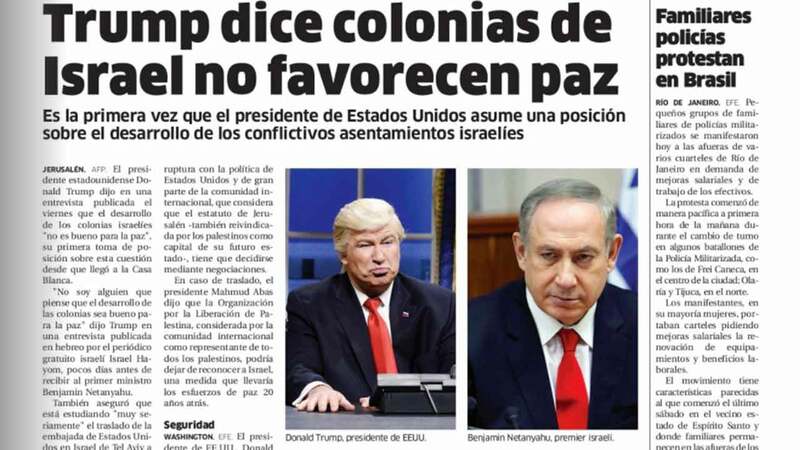 Accompanying an article in its Friday edition headlined in Spanish: "Trump says settlements in Israel don't favor peace," a photo of a scowling Baldwin in a blond wig appears next to a photo of Israeli Prime Minister Benjamin Netanyahu. In a statement posted on its website, the Dominican newspaper said a photo of Baldwin imitating Trump - over the caption "Donald Trump, president of the USA" - was published on page 19 and the mistake went unnoticed by the newspaper's staff. "El Nacional apologizes to its readers and anyone who felt affect by the publication" of the photo, the statement said. Trump has lashed out at the way "Saturday Night Live" has lampooned him, saying Baldwin's semi-regular portrayal of him "stinks."